So, it’s March and I keep wondering where summer went. But it also heralds the beginning of autumn, undoubtedly my favourite season in Tasmania. After the recent sadness of my friend passing away, I channeled my “inner Jeff” and got busy. One of his maxims was “activity with a capital A”, so last weekend I went and visited a dear friend who’s also a fabulous gardener. Her style is inventive and eclectic, mixing old fashioned cottage garden standards with some quite unusual ornamental plants as well as vegetables, fruit and a healthy frog pond in a smallish suburban backyard. Added to that, she’s divided her space into distinctly differently garden “rooms”, perfect for entertaining, reading or just lounging around. It was lovely to hang out with her and enjoy the garden. Before I left, we picked a shopping bag of elderberries, which I must say, hardly made a dent in her magnificent tree! In Tasmania, the European elderberry (Sambucus nigra) has become something of a weed as it suckers readily and birds spread the seeds very readily. Nevertheless, the elder is prized for wine making and medicinal purposes, both for the delicately scented flowers in spring and the rich, purple/black berries in late summer and early autumn. 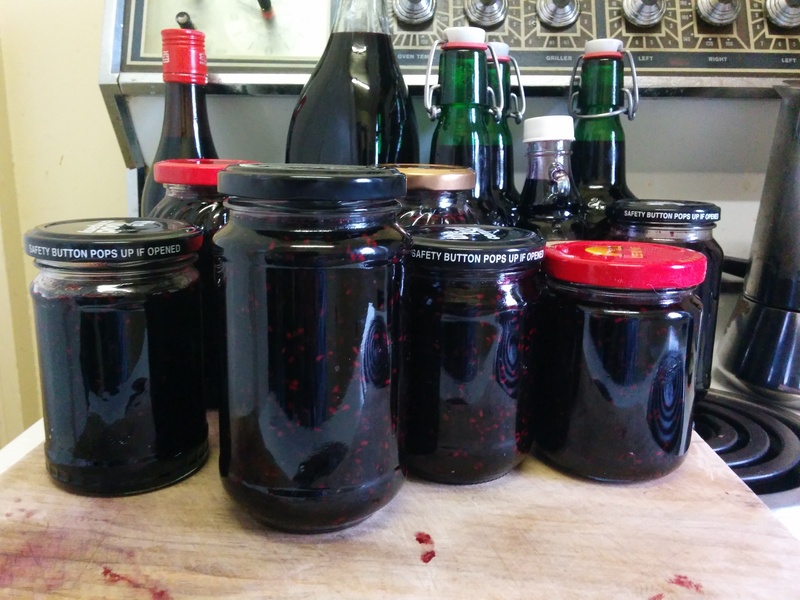 I wanted to make a medicinal (and delicious) cordial for winter, and once I got my bag of berries home, I had a great time stripping the fruit and making a mess. The shopping bag yielded over 2 kg of ripe berries! And finally, I recommend wearing old clothes when doing this – elderberries stain everything! Use a fork to ease the ripe berries off the stalks. Remove any stems, dead flowers or insects and put the berries into a stock pot. Put enough cold water over to just cover the berries. Bring it to a gentle simmer and cook, covered for 20-30 minutes. For every cup of juice add a cup of sugar and ¼ cup of lemon juice (preferably fresh) and for every three cups, add a whole cinnamon quill. Cover and leave this mixture to steep, preferably overnight. Next day heat the syrup gently and stir to dissolve the sugar. Pot up into sterilised bottles and process in a water bath to prolong storage. To use, mix approximately a tablespoon of syrup with cold water and ice or soda water. It’s also great as a hot drink – just boil the kettle and use a tablespoon or so in a cup – incredibly warming and delicious on a cold day and one of my “go to” drinks when I feel a head cold coming on. My household aren’t huge jam eaters but there was so much pulp, I couldn’t bring myself to waste it! So, extended family and jam-loving friends have all done well from this 🙂 Also, to my delight I discovered that a tablespoon of the jam in a serve of plain homemade yogurt is absolutely delicious! Measure the pulp and for every four cups, add three cups of sugar and a small bunch of lemon balm in muslin if you have it on hand. Heat gently in a jam pan and bring up to a simmer. 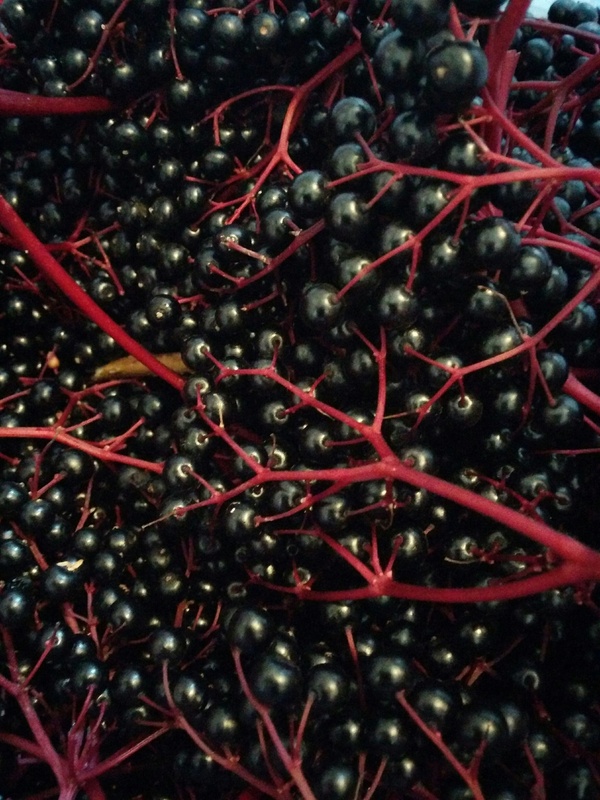 Elderberries are low in pectin so if setting point is not reached, use a commercial pectin. Add the zest and juice of two lemons. Gently boil the jam to a setting point and test. Pot up into sterilised jam jars and cover immediately. 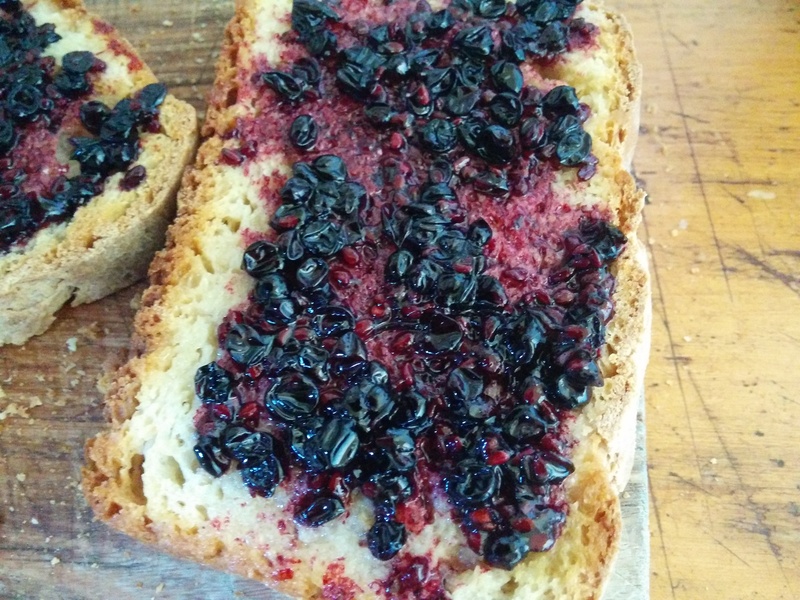 Elderberry Jam on Sourdough = Yum! Now is the time to propagate – semi-hardwood cuttings in autumn will be ready to plant out in spring.